Coming from a land with many fishing possibilities, German Florian Berger, and his girlfriend Carina Brunkhorst target almost everything with teeth from their Hi-Tech Tracker boat. 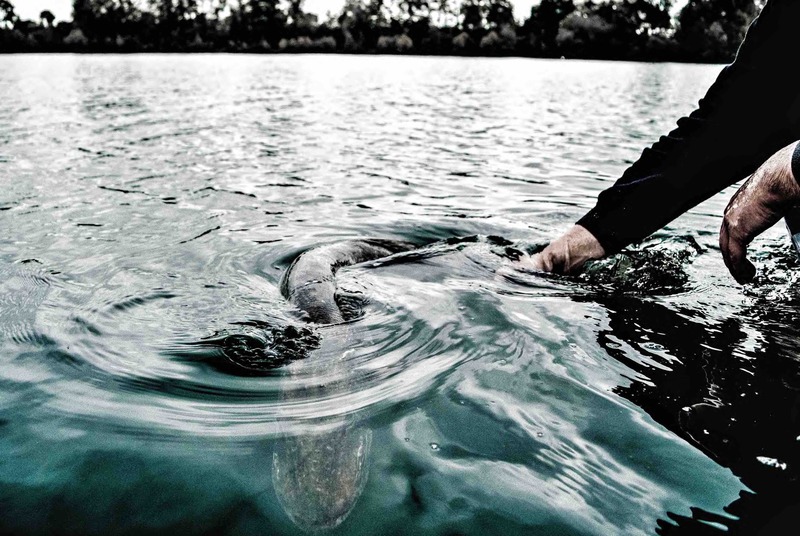 Together, they fish some of Europe’s biggest inland waters and have great results. But in Germany, the real secret lies hidden in between the shores of the remote still waters. Lurking in the deep, are predators that don’t really often see an artificial bait go by. Florian is an expert, fishing this kind of waters, where big boats cannot come, and the real game between man and nature takes place! 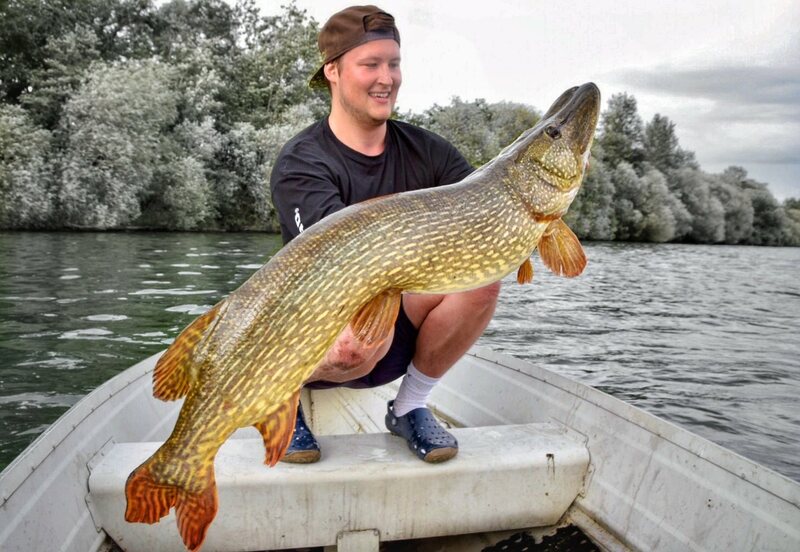 When going on about fishing for Giant Pike, you most often think about our huge waters like the brackish waters around Rugen, the Rhine-delta-region or the big Swedish lakes. But not everyone is in the lucky position to live nearby these waters or owning a boat, that is big and safe enough for fishing those waters and another huge factor in this game is time. If there is not plenty of time and you are far from these type of waters away, your local waters are the way to satisfy your chase for Giant Pikes. In this article, I want to show you my way to target those awesome predators on smaller waters, when time doesn´t allow me to get onto fishing the big waters. First of all: when I go out fishing for Pike I always want to have the chance on a big fish. I´m not fishing for big numbers of Pike. I fish for this one fish! This one Pike, that every fisherman and woman has in his or her mind. And you can reach this target also at your local waters. I like to fish on lakes between 50 and 1000 ha in size. If it´s possible I choose waters with big depth where I can fish with a rowing boat or the electronic outboard. Deeper water means a bigger potential for good sized fish in average to me. But, it´s not specifically needed. If you look at the spectrum of prey fish in our central European waters, you will find big amounts of Bream, Roach, Perch, Zanders but also Ciscoes. Yes, Zanders, awesome bait fish to our Pike believe it or not! All those fish reach good sizes and our Pike feed on them. So my choice of lures imitates those sizes. 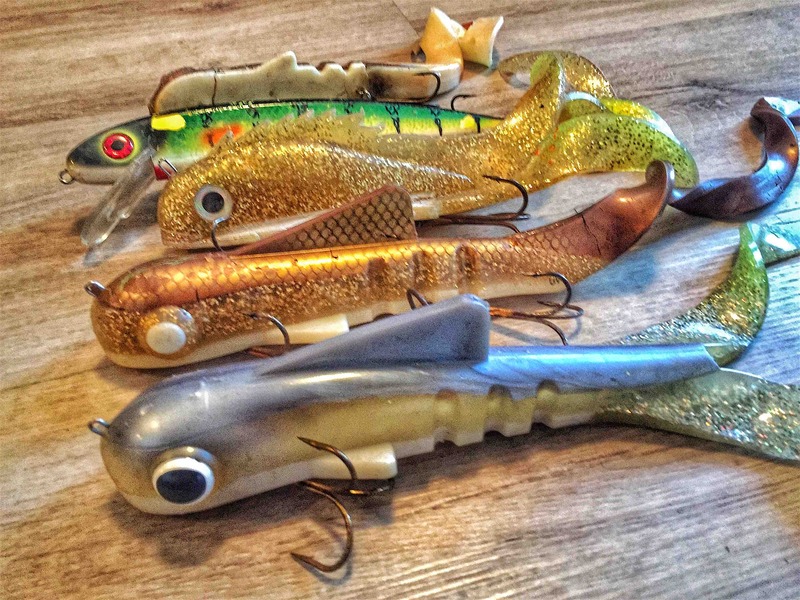 Most of the time, I fish with lures between 10” to 23” in size, or lures that pull off a lot of vibration like giant crankbaits, spinnerbaits and things like that. 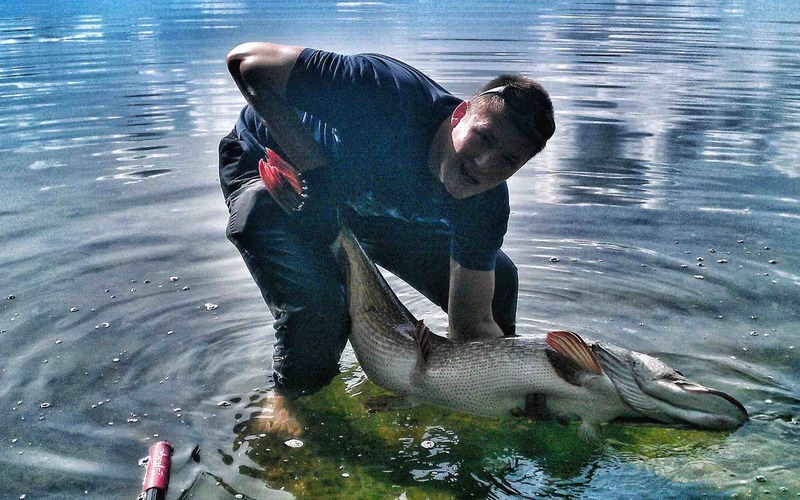 What does it mean to you, fishing giant lures for giant Pike and not numbers? You’ll need to bring three characteristics: confidence, endurance and above all, fun! What do I mean with those three key-characteristics? You will need confidence in the way you fish for these Pikes. You need this confidence that a Pike will hit a lure that has the same size as an average Pike for most of the fisherman. You will also need this confidence when your fishing buddies or other fishermen in general laugh at your baits. But you know it better because you will catch fish they just catch once in a lifetime in a constant way! Endurance might be The most important point on my list because fishing with this giant lures like Musky Innovations Bull Dawgs (Magnum and Super Magnum Size) and all this “twister-style”-stuff or giant rubber, in general, can really be mind-boggling. You will not catch 20 fish a day and sometimes you have to fish three days to get one bite. But in the end, it´s worth it. The average size of your Pike will increase and also the possibility of hooking into a giant! I don´t catch hundreds of Pike each year, but I catch big fish and my average size of Pike increased over the years to about 38” (95cm). Endurance will pay off and when you got your new personal best in the net you know it all was worth it. Casting lures over 300gr the whole day needs this endurance. Fun, the last point on my list, is a necessary need to keep you going. If you don´t love what you do or don’t have fun in this style of fishing, you will surrender and give up. But believe me, you’ll get fun fishing this way. After the first follower, and mark my words, you will get many followers, it’s the craziest and funniest thing in this fishery. You will never forget the first one following a huge bait all the way to your boat. You will never forget the first crucial strike on a big bait. And to top things off, sharing this experience with a good fishing friend is the biggest fun of all. Now, what kind of tackle do you need for this style of fishing? Remember, casting lures with weights over 17 ounces (500 gr) means immense stress to your tackle. Every part of your chosen tackle setup has to be strong. If you have the best rod and the best reel, but you save up on the smaller parts like swivels, split rings and things like that you will lose. And that’s the last thing that you want. So always be prepared the best way you possibly can. Rods for casting big rubber baits and big blades should have a fast action. Crankbait rods should have medium to medium fast action. Rods between 8ft and 9’6ft are the tools of the trade. The longer the rod, the easier casting will be. 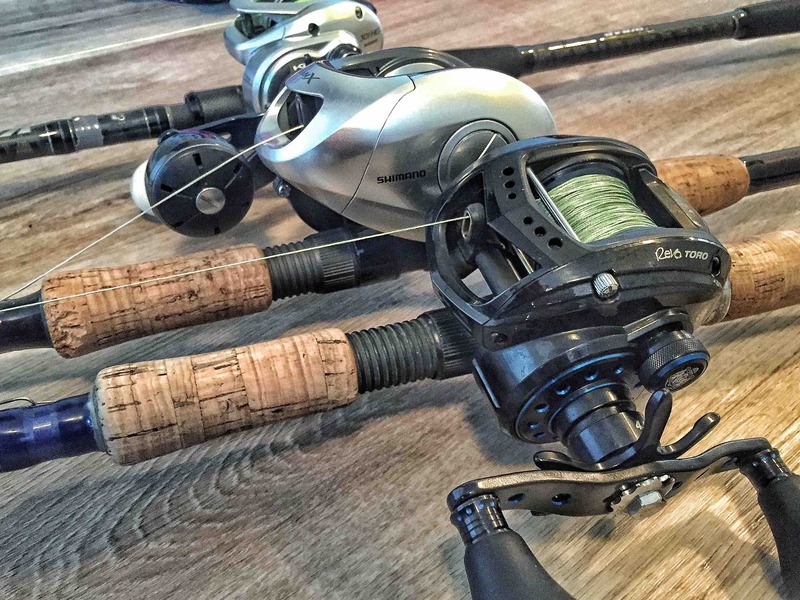 I’ve tested a lot of different rods over the years and my go to rods are all from St. Croix. In my opinion the best rods for this style of fishing. They are light weighted and unbelievable strong. I have never broken one. I really like the Legend Tournament Musky series and also the Mojo Musky rods are awesome rods that I fish whenever I can. For casting baits up to 10oz (300gr), I’d like to use a St. Croix Legend Tournament Sling Blade, but it can handle baits up to 14oz (400gr) and more if you cast the lures out from the water in order to load the rod. But more often I use the Mojo Musky 86xh or the Big Dawg for casting pounders and big baits like that. 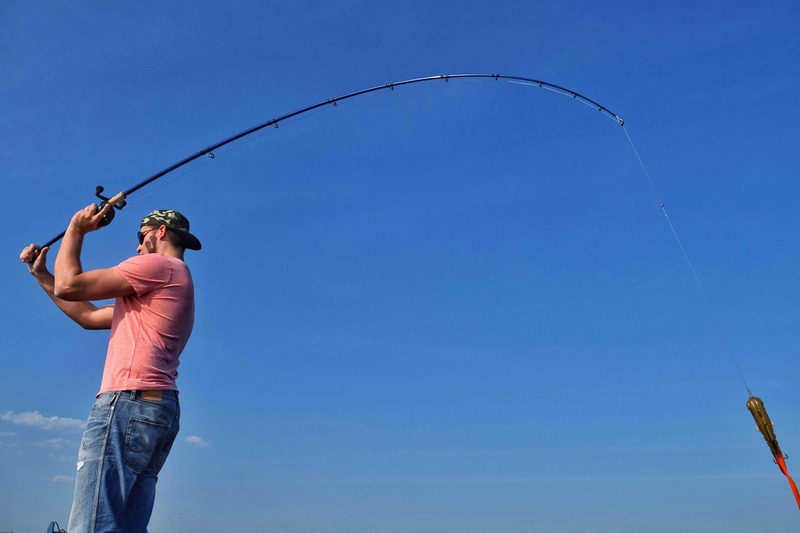 If you ask me for the perfect rod for all purpose of heavy fishing, it would be the Big Nasty, a 9ft rod from St. Croix, built on an 80lb blank and a lure rating of nearly 10oz, but it can handle way more than that. Of course, there are many other quality companies too, that deliver good tools for this way of fishing, but for me, St.Croix rods are the best. No rod can be worked without a reel, so this part of the setup is also very important. There are some really good reels on the market, from all kinds different companies. Abu Garcia´s Revo Toro Beast, Shimano´s 400&500 size Tranx, the 400 sized Calcutta´s and Daiwa 400 size Lexa are all doing an awesome job. They all have solid gears and a heavy brake and that’s exactly what you need when setting the hook to a Monster fish when using big baits. As far as the line concerns, I use an 80-100lb braided line that is strong enough the withstand the heavy force of these fish. And lost but not least, the leader. For this, I like to use Fluorocarbon with at least 1,1mm in diameter up to 1,3mm. Losing a 130cm (51”) pike just because you used a smaller 0,80mm wire, for example, is not worth it! You can also choose to use titanium, but when using this, I would always recommend choosing the 1×7 material with at least 80lb. The 1×7 material, because you can see when it begins to break on the single strands. I lost quite a few lures with single-stranded titanium because it just broke while casting. That’s the problem with titanium. It´s not made for fishing. The swivels and split rings should all be made of heavy duty material and need to be high quality. Don´t save up here! Don´t use swivels, snaps or splitrings under 50kg lifting capacity, because they simply won’t withstand the force these Pike put into a fight. So what`s the method of choice? When I go out to explore new waters, I always start trolling, look out for underwater structures on the lake. I use my electronics, especially the Humminbird Helix 10 G2N to create a map via “Autochart Live” while trolling. After this is done, I’ll start casting at areas with big drop-offs, weed beds or open water where I’ve seen bait fish or solitary fish on the sonar. Fishing the year round is very different. The lakes I fish have an average depth of 65ft till around 131ft. Early season, after the spawning period, I start fishing on big weed beds with a drop-off. If this doesn´t work, I like to cast on deeper weed beds where the weed has just started to grow. With the warmer water temperatures, the big baitfish start to move into open water, feeding on plankton and dozens of young fish. A fast retrieve, with short pauses, is the way to go here. At this time of year, our big female Pike start to move in deeper water, following the big schools of baitfish. That’s my favorite time of the year, open water season! I look with my electronics for warmer water and concentration of baitfish. If you just have a map it´s also no problem. The easy way is, to follow the wind. The wind-side of the lake will be the interesting one because all the plankton will drift to these areas. This is probably one of The best times of the year to catch a true Giant. Especially the full-moon and new-moon phases in June of each year can be just magic. Fishing your spot right at moon rise / set or the highest point of the sun will do the job. I always try to be on the water when we have a full moon or around new moon phases. While the water temperatures increases during the Summer, a thermocline can build up in your lake. You will see this at your electronics as a thin line in the middle of the water. The Pike will hold up in this layer of the water, and as the temperatures drop, there will be more at their temperature-optimum than in the water shallower in the water column. This is where you have to present your bait. Rip it fast or burn it and you will get bites. Blades, big rubber and also dive and rise baits are the key to success here. But, be careful. Pike are very sensitive fish and won´t handle well when fished in water hotter than 70F. There are two factors that play a key role to a good and successful release. You have to know that the oxygen-level in shallow, warm water is very low which is also one of the reasons why Pike will hold in deeper, cooler water where the oxygen levels are much higher. When you catch a Pike in deeper water and pull it up to the surface, it will have oxygen difficulties additional to the stress. The other point, to the higher mortality at this time of the year, is the problem of pressured equalization. The fish just have a problem with it. Once they are at the surface for more than just a few seconds, they start to get a balloon-like belly, filled with air. The Pike is not made for fast pressure equalization. If you look at a Pike’s attack, they mostly attack from deeper water. After the attack, they immediately move back in the depth. Those two points are the reason, in my opinion, why it is critical to fish in the deep water while having high water temperatures the first few meters of the water column. When we have those situations, I let the Pike be a Pike and come back when water-temperatures are safe to fish again. When Autumn starts and the thermocline disappears the next magic time of the year is just going to start. Same game, as in early Summer. Moon-rise, moon-set etc. are the times you have to be on the water. Fish will move around in the complete water column and will feed for the upcoming spawning period as they start to their build eggs. In this time of year, I barely fish baits under 20 inches, like Pounders, medusas and some other magic lures. In Winter, just before the spawning period, the Pike start to move shallower, close to their favorite spawning areas. At this time of the year, everything has to be a bit slower. Fishing shallow rigged lures extremely slow, with long pauses, will trigger the fish to bite. That’s the time when you can get those absolute super tankers with massive weight to it. Some general tips at the end of this article: When casting heavy baits, try to learn to cast out from the water. That means to hang the lure in the water and then cast. It will be more comfortable than casting these lures hanging in the air. When you get a strike, immediately set the hook one or two times hard as hard as you can. The brake of your reel should be closed. That´s the only way to get a quality hookset. Fight the fish hard. The shorter the fight, the better the release. You also need some essential tools for a proper release. The first one is the most important. A quality HOOK-CUTTER!! I use the cobolt from Knipex and it´s definitely worth its money. When a hook sits badly in the Pike it’s mouth, I just cut it out. The fish will thank you for it The next tool is a big, rubber-coated landing net. Land your Pike and let it sit in the water until you measure it and take a quick photo. Also remove the hooks in the landing net, while the fish sits there and is able to breathe. I absolutely hate it, seeing those guides or “pro-anglers” landing their customers fish and get it immediately into the boat. Their customers will copy this behavior and it causes and more Pike will die. Just imagine you are doing a 100m run and someone will take your head under water immediately after the run. Make’s sense right? One last thing, never ever hold a big fish vertically!! We all did it before and I hope we all learn from it. I would never hold a Giant Pike, like my 55”3” (140,5cm) monster Pike vertically on one hand. So guys and girls, get out on the water and catch a Giant, now it´s “magic-time” again! Wish you all the best, or “Petri heil” as we say here in Germany.